The fight against food waste is an integral part of what we do here at Hungry Harvest. From helping to reduce excess water use to lowering greenhouse gas emissions, every delivery helps protect our environment. But we want to see if we can take that a step further and try to better tackle the amount of individual waste we produce each day. According to the EPA, the average American throws away about 4 pounds of trash per day! Surely we can do better than that. 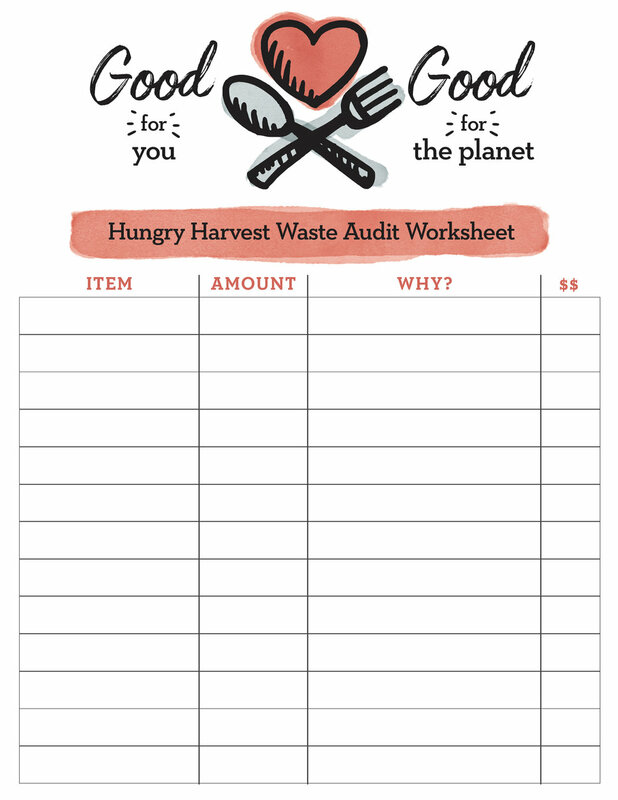 So with that in mind, for day Day 6 of our Hungry Harvest 30 Day Challenge, we’re asking you to make note of how much or how little you’re actually tossing in a day by performing a Home Waste Audit. Getting yourself set-up is easy with a chart like this. Bonus points if you keep track on your computer with this editable PDF instead of printing it out . . . although hanging a copy (or placing a chalkboard or dry erase board) by your trash, compost and recycling bins might help keep you honest. The rules are simple and apply to everything you prep, cook, eat or use that produces some sort of waste. While we strategically put this task on a weekend so you could have more time to put towards it, the only way for this to really work is if you choose to do it on a typical day with your usual behaviors. Think of it as a journaling exercise without judgement or guilt. Anytime you go to throw something away, make a note of what it is, why you’re tossing it, and how much is going bye bye. If you really want to go full on, you can estimate the cost associated with it. Don’t go for the easy answers. The point of this is to honestly challenge yourself on the why. Did that item really just “go bad?” Or did you perhaps buy too much, cook too much, or simply didn’t like it? Be sure to include every paper napkin, piece of packaging or food scrap regardless of whether you are at home, work, or simply out and about. At the end of the day, how did you do? Were there any surprises? Where does your waste seem to come from primarily? If you found out that a lot of your fruits & veggies were landing in the trash, maybe it’s time to up your food storage game making sure you are putting items in the proper place in your fridge or counter. Check out our storage guide for tips! If you noticed a lot of single use packaging being tossed, try buying in bulk and investing in some more sustainable kitchen gear to help you portion out your servings. If the leftovers are piling up, try cooking smaller portions, taking the extras for lunch, and freezing whatever else you can’t eat up. If spontaneous activities or purchases threw you off your meal plan, try creating a more realistic grocery list and stick to it! Or shop as needed, buying less more often might work better for your lifestyle. To gain a deeper understanding, keep the audit going. What would your chart look like after a week or a month? Would it inspire you to modify any of your current habits and behaviors? By writing down how much we waste, we can begin to recognize patterns that can better inform our decision-making when it comes to how we shop, cook, store, eat, live, work & play. With that in mind, we’re in a much better place to start reducing the amount of trash that ends up in a landfill from our day to day. Congratulations on taking that first crucial step on the path to a zero waste lifestyle with us! Looking to review the rest of the challenges? See the full schedule here.